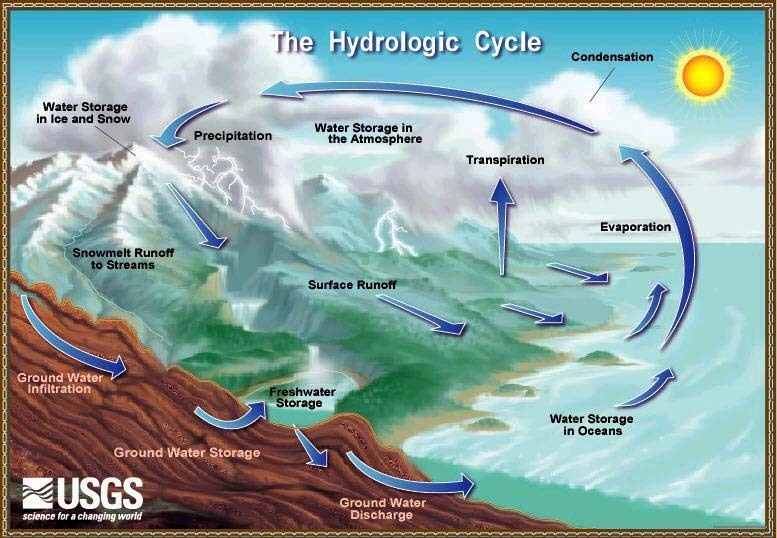 The hydrologic cycle consists of inflows, outflows, and storage. 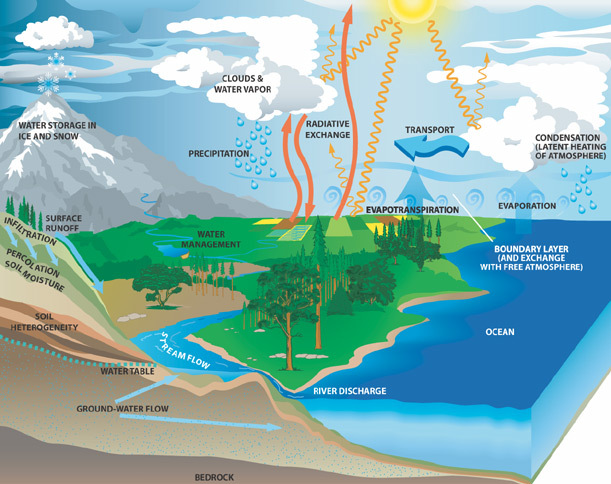 Inflows add water to the different parts of the hydrologic system, while outflows remove water. Storage is the retention of water by parts of the system. Because water movement is cyclical, an inflow for one part of the system is an outflow for another. 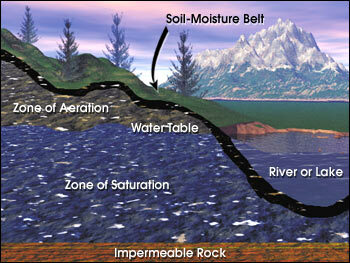 Looking at an aquifer as an example, percolation of water into the ground is an inflow to the aquifer. Discharge of ground water from the aquifer to a stream is an outflow (also an inflow for the stream). Over time, if inflows to the aquifer are greater than its outflows, the amount of water stored in the aquifer will increase. Conversely, if the inflows to the aquifer are less than the outflows, the amount of water stored decreases. Inflows and outflows can occur naturally or result from human activity. Evaporation is the change of state in a substance from a liquid to a gas. In meteorology, the substance we are concerned about the most is water. For evaporation to take place, energy is required. The energy can come from any source; the sun, the atmosphere, the earth, or objects on the earth such as humans. Everyone has experienced evaporation personally. When the body heats up due to the air temperature or through exercise, the body sweats, secreting water onto the skin. The purpose is to cause the body to use its heat to evaporate the liquid, thereby removing heat and cooling the body. It is the same effect that can be seen when you step out of a shower or swimming pool. The coolness you feel is from the removing of bodily heat to evaporate the water on your skin. Transpiration is the evaporation of water from plants through stomata. Stomata are small openings found on the underside of leaves that are connected to vascular plant tissues. In most plants, transpiration is a passive process largely controlled by the humidity of the atmosphere and the moisture content of the soil. Of the transpired water passing through a plant only 1% is used in the growth process of the plant. The remaining 99% is passed into the atmosphere. Condensation is the process whereby water vapor in the atmosphere is returned to its original liquid state. In the atmosphere, condensation may appear as clouds, fog, mist, dew or frost, depending upon the physical conditions of the atmosphere. Condensation is not a matter of one particular temperature but of a difference between two temperatures; the air temperature and the dewpoint temperature. Precipitation is the result when the tiny condensation particles grow too large, through collision and coalesce, for the rising air to support, and thus fall to the earth. 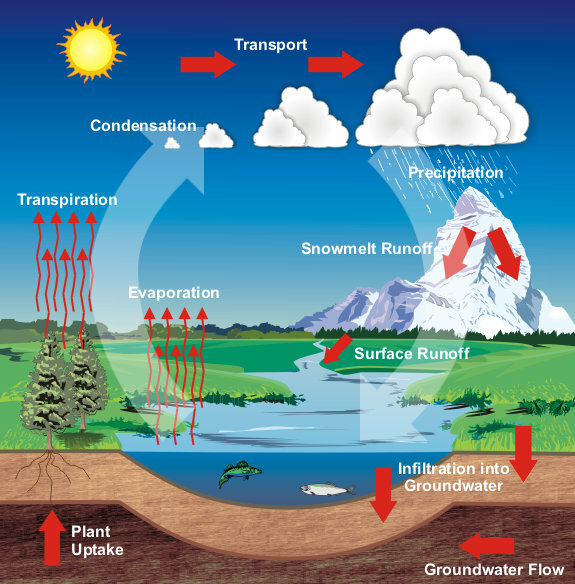 Runoff occurs when there is excessive precipitation and the ground is saturated (cannot absorb anymore water). This runoff flows into streams and rivers and eventually back into the sea. Evaporation of this runoff into the atmosphere begins the hydrologic cycle over again. Some of the water perculates into the soil and into the ground water only to be drawn into plants again for transpiration to take place.